The new kids on the block are BullDog Professional Yeasts. 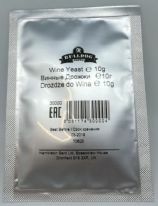 Another first for homebrew in Ireland, these really are top quality yeasts. The range will be extended over the coming months. These are the ones to go for if you can find a suitable strain. In addition to being the freshest strains we carry, they are superb value. Most come in 10 to 28 gram sachets (as opposed to 5 or 8 grams).